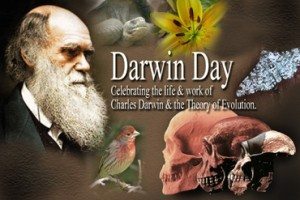 National Darwin Day is observed each year on Februarky 12th. Ever since Charles Darwin published his radically insightful book, On the Origin of Species, Darwin has been the focus of commemorations and tributes by scientists, artists, scholars, and freethinkers throughout the world. From the early gatherings after his death at his own Downe House, to bicentennial events all over the globe, celebrating science and humanity within our various cultures internationally has been a resonant and transcendent pursuit. In 1909, on the 100th anniversary of his birth, large celebrations honoring Darwin’s contributions to science and humanity were held in Cambridge, New York and New Zealand. The University of Chicago commemorated the 100th anniversary of the publication of On the Origin of Species in 1959 with a series of notable events from November 24 through the 28th. The 200th anniversary of Darwin’s birth saw an entire season of BBC programming on Charles Darwin himself as well as evolution and natural selection. Salem State University has successfully held an annual Darwin Festival since 1980.